In order to setup the MediaSpace Module's captioning integration, the Kaltura/3Play Media must first be set up! In order for the Threeplay module to become available within the MediaSpace Module, Kaltura support will need to be contacted to request this module to be added the MediaSpace Admin panel. Once the Kaltura KMC is linked to your 3Play Media account, your MediaSpace credentials will be displayed within this newly linked account's Settings section. 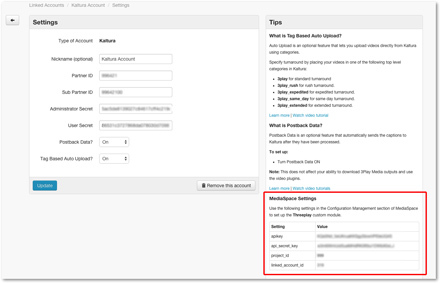 The MediaSpace Settings section is located at the bottom, right-hand side of your Kaltura linked account Settings page. Note these credentials for later use. At this point, you have connected the Kaltura KMC to 3Play Media. Now it’s time to connect the MediaSpace Module to your 3Play Media account. Sign into MediaSpace as an admin. Once the MediaSpace Admin signs navigate to the Admin section. 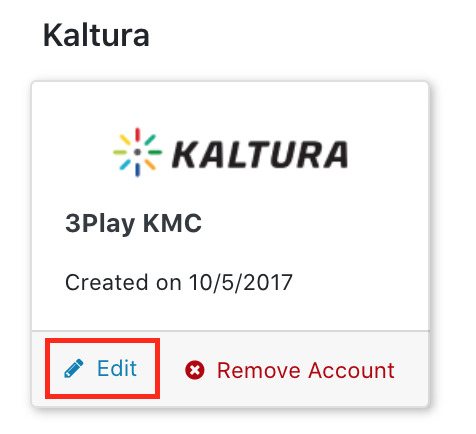 If the Threeplay module is not displaying in the admin section please contact Kaltura support to have this added to MediaSpace. Once the Threeplay module is enabled enter the credentials retrieved in step 1. Click Save once Enabled is set to Yes and the credentials have been entered.